law signed by President Obama Wednesday are just not thinking rationally. If a soldier is stuck in a fox hole what he’s concerned about when it comes to the person next to him is not whether he’s gay but whether he’s a good soldier and will act accordingly. There will be bumps in the road but this was clearly the right thing to do. don’t pay much attention to basketball at the school. Is it me or does it seem like many places still have a lot of Christmas trees left to sell? You can probably make a good deal today on one. Just when it looked like Rex Ryan and the Jets had moved the needle from negative to positive comes a story involving the head coach’s wife…well maybe. A website shows videos of a woman who looks very much like Michelle Ryan displaying her toes and having an intimate chat with a man about her feet. It certainly is true….the thrill of victory is better than the agony of da-feet. Toms River High School South will have a new football coach next fall as Bill Hill will not be coming back for a fourth year. The injury-plagued Indians did not win a game this past season for the first time in nearly five decades and a change had to be made. This is one of the shore’s tradition-rich programs and even when times are not great there is no better place for a Friday Night game than Detweiler Stadium. Here’s hoping that you have a great holiday, including a merry Christmas and Happy New Year. If Santa Claus does not bring you exactly what you want remember that he’s got a long list and sometimes gets confused. It seems like many people have an opinion about the now record 89 game winning streak put together by the Connecticut women’s basketball team. Last night’s rout of Florida State allowed the Huskies to break the record set by John Wooden’s UCLA men’s teams, who won 88 in-a-row before losing to Notre Dame in 1974. The controversy or issue comes when you try and compare the two milestones and in my opinion you simply cannot and don’t need to. What UCLA did 36 years ago and what U. Conn is doing now should stand on their own as separate and remarkable achievements. What is similar is that both teams were able to recruit many of the best players at that time and they played for extraordinary coaches….the late great Wooden and Geno Auriemma. Those who argue that Connecticut’s streak is largely due to inferior competition are not giving the Huskies their due. 30 of their 89 wins have come against nationally ranked opponents which is considerably more than UCLA had during its streak. But again let’s stop comparing and instead celebrate both records for what they represent….dominance and greatness. Jackson Memorial, Southern and Toms River South are not only considered the top three wrestling teams at the shore this season but they are all in the same division and their head-to-head matches will decide the Class A South title. The first of those takes place tonight when the Indians head to Manahawkin to wrestle the Rams. South is hoping to return to their glory days of the mid- 70’s when grapplers like Jeff Parker helped Hall of Fame coach John DeMarco win the first four Shore Conference Tournament titles. Ron Laycock, who wore the maroon and white for DeMarco, is now the head coach and he’ll find out how far his program has come when they lock horns with John Stout’s Rams. The winner will still have to get past Jackson later in the winter but they clearly become the top challenger to the Jaguars. I guess if money and time are not a problem than Christmas shopping might be something to look forward to but frankly for most of us both can make the task about as enjoyable as going to the dentist. Wait a second….trips to the dentist these days are often painless but a trip to a shopping mall can leave you suffering. I don’t like Christmas shopping but in recent years have turned this chore into an annual pilgrimage with my daughter Alex and it’s actually become something I think we both look forward to. and armed with a list we would dash through stores and malls to complete our frazzled odyssey. She is now in college and I must admit to looking forward to our foray yesterday because like all good things this too will come to an end so I want to enjoy each one of our father-daughter outings. Well a little more than six hours after we started we had completed our mission and with only an exception or two got everything we wanted. In those six hours we were in and out of the car several times, had a very enjoyable lunch, and listened to a mixture of Christmas music and Dave Matthews. I was exhausted when I got home and glad the ordeal was over but thrilled at the same time that Alex and I had the day and adventure to share. A little side note to yesterday. We were going into a Barnes & Noble and I could not help but notice a woman walking to her car in the parking lot. While she was very attractive what made her stand out was she was getting into a car which was parked perfectly in the middle of two spots in the packed lot. It’s not unusual to see someone with a very expensive car taking up two spots and it does not bother me when they do it in the outskirts of a lot in open spaces. However this woman, who really did not have a luxury vehicle, took up two spots right in front and I was so tempted to say something but in the spirit of the holiday I did not. I wonder if she’ll notice the key scratches on the passenger side. or “Meltdown at the Meadowlands” the Birds rallied for 28 points in the final 7 ½ minutes to stun the G-Men and all but lock up the NFC East. On the game’s final play DeSean Jackson returned a punt that should never have come in his direction 65 yards for the winning touchdown to set off a wild celebration for the visitors from Philly while Giants fans sat in stunned silence. The Giants will now have to win road games in Green Bay and Washington to probably earn a wild-card playoff spot. To make matters worse for head coach Tom Coughlin, former Steelers coach Bill Cowher apparently is ready to return to the sidelines and the Giants are atop his list. The first round of the 27th annual WOBM Christmas Classic at the Poland Spring Arena is complete and while there were some anxious moments Sunday for favorites, only one lower seed managed to advance into the quarterfinals. In boys action yesterday, 11th seed Wall fell behind #6 Brick Memorial 16-0 but went on to top the Mustangs by 16 points, 63-47. The Crimson Knights will next face #3 Manchester, who cruised past Toms River East as D’Andre Little scored 18pts. Top seed and defending champion Jackson Memorial got all they could handle from Ocean before winning 37-32 and will play Lacey in the quarterfinals as the Lions ripped Barnegat behind Deon Smith’s 24 points. 2nd seed Point Boro was tested from Brick before pulling away in the 4th quarter for an 11-point win and the Panthers will have to play better when they next meet Central, who squeaked by Toms River South 38-35. The other boy’s quarterfinal next Monday will find St. Rose taking on Toms River North. The Purple Roses turned in the day’s most impressive performance as they crushed Southern while the Mariners needed overtime to get past Monroe 65-61. It’s the opening weekend of the high school basketball season and it features some interesting matchups tonight and the first round of the WOBM Christmas Classic this weekend. Tonight’s boys schedule is highlighted by a matchup between Neptune and Lakewood at the Piner Palace. The two perennial shore powers return just about everyone from last year and certainly should be among the top five teams with both expected to challenge for division, shore and state titles. Lakewood has one of the top players around in Jarod Davis and this is a tremendous season opener. Among tonight’s other openers, Point Boro visits Manchester, Monsignor Donovan hosts Central, Jackson Memorial battles Jackson Liberty, and Eric Fierro makes his debut as Southern Regional head coach when the Rams head to Lacey. The Girls schedule is pretty much just a reversal of home courts and the top game find Manchester at Point Boro with the Panthers a team to watch this season after winning 23 games and the South Jersey Group 3 title with a very young nucleus last winter. when Brick Memorial plays Wall and a half an hour later Southern will tip off against St. Rose. Jackson Memorial and Point Boro are the top two seeds and the complete schedule is available on our web site, wobm.com. 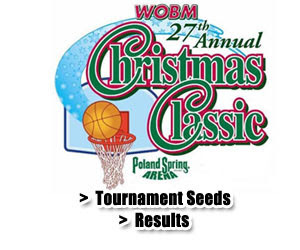 The WOBM Christmas Classic resumes on December 26th with eight games every day until the 30th when the finals will be held. I’m sure some of you have or will be making a trip to pick up children who are away at college and returning home for the holiday break. Often this is something you only have to do when they are freshman because in most cases they don’t have a car and there are loads of laundry and other stuff making its way back into your house. The reason there was no Hometown View yesterday was because this was the position my wife and I were in with our daughter, who of course couldn’t make this a routine pick up and bring home trip. We headed up to Penn State Tuesday afternoon and arrived just after Alex finished the last of her final exams. Like many she had spent just about all of her time the last week or so in the library studying which meant she had not done any packing. and in her case there was a lot of it because she and her roommate are switching dormitories for the spring semester, moving into one that houses most of the members of their sorority. So four months after lugging everything into a dorm in the heat of summer we were now going to take everything out in frigid temperatures and move it across campus. After dinner Tuesday we loaded some stuff into the car and left Alex, her roommate Nicole and another friend to pack. We went to our hotel as I desperately needed some sleep after a long day. and pile it on her bed because it has to stay that way so the room can cleaned over vacation. We made one more trip back to the old dorm to load all her clothes which she brought back for the 3-week break and we hit the road for the trip back home at 1:30. Of course you know what this means? We have to go back with her in a little more than three weeks so set up the new room. as the tournament gets underway this weekend. With four starters back there was little surprise that two-time defending champion Rumson-Fair Haven would garner the top seed in the Girls Division and the Bulldogs begin their title quest Saturday night against Lacey in what will be the last of eight first-round games played that day. Led by Rutgers-bound Christa Evans, Jackson Memorial is the #2 seed and plays Raritan, Point Boro secured the #3 spot and will open with Barnegat and 4th seeded Toms River North takes on Ocean. At yesterday’s event we honored Professional Orthopaedic Associates of Toms River, Tinton Falls and Freehold for their longstanding support. Dr. David Gentile was on hand to accept the Jim Ruhnke Award for contributions to the tournament. Professional Orthopaedic Associates has sponsored and helped provide Athletic Trainers in recent years to work the 52 games that will be played starting this weekend. Later this week I will talk about another aspect of the WOBM Christmas Classic which makes it a rather unique event. were a lot of people out and about this weekend although Sunday’s rain probably didn’t help retail sales…thank goodness it was pretty warm or we might have had some white stuff. Speaking of which, did you see the video of the partial collapse of the Metrodome’s inflatable roof in Minnesota? It looked like tons of flour pouring onto the football field and of course forced the Giants game with the Vikings to be moved to Ford Field in Detroit tonight. That game will kick off at 7:20 and be televised by Fox. A Giants win would move them into a tie with the Eagles for first place in the NFC East heading into Sunday’s showdown at the Meadowlands. I guess you can scratch Al Golden’s name off the list of possible successors when Joe Paterno finally retires at Penn State. The Colts Neck native and former Red Bank Catholic standout was named the new football coach at the University of Miami with Hurricanes fans hoping Golden can turn around their fortunes like he did at Temple. The 41-year old did a remarkable job in five seasons with the Owls and it was just a matter of time before he took a higher profile position. I was among many who thought that position might be at his alma mater in Happy Valley but Golden instead is heading to South Florida with a five-year contract and a great opportunity. Here’s hoping he makes the most of it because he’s a quality coach and individual. Many years ago I was doing a small research project for work which forced me to look through reels and reels of microfilm at the Ocean County Library. I remember coming across an ad of some sort in the Asbury Park Press that identified Dr. John Lauria as being the first chiropractor in Ocean County. I knew him for years because we both worked out at what was then the Toms River Racquetball and Fitness Club. The next time I saw him I mentioned the ad and we had a long conversation about what it was like when he opened up his practice in Toms River. Doc was a great guy to talk with, whether it was about skiing which he loved or baseball…his son Chris was a standout player at Toms River South and later the University of North Carolina. The last time I saw him was probably a couple of years ago and this morning I learned that Dr. John Lauria died over the weekend at age 80. He leaves behind his wife, five children, 8 grandchildren and a lot of great conversations in the sauna. It will be a busy weekend for the many volunteers who make “Kevin’s Kids” one of the truly great things about the holiday season. In its 28th year the program brings Christmas to kids and families in Manchester Township and is spearheaded by the efforts of Kevin Burger, a school district administrator and his wife Peggy. There have been a myriad of fundraising projects going on over the last couple of months and tomorrow dozens of volunteers will go shopping to fill the wish lists of about 400 township residents. Sunday they will then wrap all the presents which will be picked up by thankful families later in the day…in most cases parents will be able to tell their little ones that Santa Claus indeed made it to their house. There is no better example of how it’s better to give than receive then this wonderful holiday project in Manchester, fueled by the efforts of many. NHL Hall of Fame Scott Stevens and Brick Township’s favorite son Jim Dowd will team up later today to help raise money for the Green Dragons Ice Hockey program. Stevens and Dowd were teammates on the New Jersey Devils 1995 Stanley Cup team and tonight they will put on a pair of hockey clinics at the Ocean Ice Palace with all proceeds going to pay for practice time and other items slashed from the school budget. The clinics will be split up based on age and the cost is $60 per player. Dowd of course played for legendary Green Dragon’s coach Bob Auriemma and recently ended a 17-year NHL career. Through his “Shoot for the Stars Foundation” he has raised a tremendous amount of money for many organizations and individuals in the shore area. For information on tonight’s clinics you can call the Ocean Ice Palace at (732) 477-4411. Bergen Catholic, Cherokee, Holy Spirit and then 12-0 Lacey, who captured the South Jersey Group 3 title last weekend. #19 Freehold was the only other shore team in the top 20. I’m been glancing at the Asbury Park Press this week and reading their coverage of what is the Pop Warner National Cheer & Dance Championships at the ESPN Wide World of Sports Complex in Lake Buena Vista, Florida. It appears that the Jersey Shore area is always well-represented at this event with a large number of teams able to raise the money necessary to travel and compete for big trophies. I guess what I wonder is why nobody ever makes an issue that this event requires students to miss school right after they’ve been off for Thanksgiving and will have a long break for Christmas. Of course this is a big money maker for Disney World as thousands of kids and their families head to Florida for the cheerleading events as well as youth football games. It’s perfectly timed for the resort as it comes just before the Christmas vacation which of course is a very busy period. Bottom line is like many other events this one exists to make money and there is apparently a lot to be made. Even if you are more Grinch than Santa Claus you have to admit houses that are decorated for Christmas add something to a street or neighborhood. There is something about driving around at night during the holiday season and seeing home after home lit up and tastefully decorated. Sorry to say but the Monmouth University Men’s basketball program has really fallen off the radar. Despite having a tremendous facility to play in if the Hawks don’t win some games there will be plenty of seats, rows and sections available at the Multipurpose Activity Center. Worse part is that the students themselves really don’t seem to care. Speaking of basketball…we held the seeding meeting for the 27th annual WOBM Christmas Classic last night with the 32 boys and girls coaches. The top seeds are…..sorry we don’t announce them until Monday when we hold the Tipoff Brunch at the Quality Inn in Toms River. Has pro basketball returned to New York? After a decade of futility the Knicks are showing signs that time might be changing. They have now won 6 in-a-row and 11 of their last 12 games and are exciting to watch. Of course at the end of the day you must remember this is the NBA which most people care little about. It seems that about a week ago we abruptly went from fall to winter and out came heavy coats, gloves and hats. Another sign, at least for us here at WOBM has been the recent flurry of phone calls inquiring about weather-related announcements. Yes while we are many things to many different people the one constant is that much of Ocean County will turn to us first during bad weather for storm-related information, including closings and cancellations. With winter pretty much here I am as a public service spending a moment this morning alerting you to our Stormwatch program. This is especially important for those of you who are enrolled in the program as well as those of you wanting to find out details about becoming part of it. If you have listened to this station during winter months with bad weather (like last year) than you know what it’s like…well you know some of it. For many years the only way we had to inform you of weather-related announcements was to read them over the air and this was after several of us would spend hours answering phone calls and logging the information. As the county and our list grew this was no longer a practical way to disseminate information so in recent years we have gone with a web-based program. This program has proved very valuable for both us and you and a few changes have been instituted for this winter. For those of you already part of Ocean County Stormwatch than the big change is that you will now go to the website, www.njstormwatch.com to report your cancellation or delay. You should update your computer’s favorite places and your Stormwatch notes with that address. The good news is that you can still use your user name and password from last year. If you have forgotten or misplaced that information you will find a short form on the website which you can fill out…however do not wait as you should have the required information before bad weather hits. Without your user name and password you cannot log on and report your announcement. For those organizations that are not part of our program than all you need to do is visit www.wobm.com and look for the “Ocean County Stormwatch” link. It will direct you to a form which can be filled out that’s how you get into the program. As for you listeners there are two ways for you to get the information you need when bad weather hits. 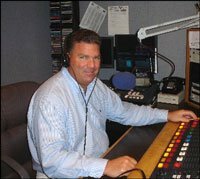 You can visit www.wobm.com 24/7 and get the information as we receive it or you can listen to 92.7FM. Either way we’ll be there for you this winter like we have since 1968. September 11th, November 22nd and December 7th. 9/11 of course needs no explanation and if you are 50 or older you probably remember November 22nd as the day JFK was assassinated. Those of you in the younger generation may need a reminder as to the significance of today. This is the 69th anniversary of the Japanese attack on Pearl Harbor which claimed the lives of 2,400 Americans and the next day led President Franklin Roosevelt to declare war on Japan as he proclaimed “December 7th, 1941…a day which will live in infamy.” Today is a bitter reminder for those that survived the attack on the U.S. Naval base in Hawaii and the anniversary is traditionally marked by the return of some of those survivors although sadly that number is dwindling. There will be a day not too far from now in which there are no survivors still alive but December 7th will indeed always hold historical meaning and purpose and should not be forgotten. Unless you are my age or older you have no idea what Monday Night Football was like years ago. Before ABC began televising a weekly Monday game in 1970, pro football fans pretty much were limited to watching a couple of games on Sunday. Monday Night games became events and the main announcing trio of Frank Gifford, Don Meredith & Howard Cosell were superstars. Meredith, a former Cowboys quarterback died over the weekend at age 72 and it’s made many of us think fondly about how special those Monday games were. Ironically one of the significant moments during one of those games took place on December 8th, 1980…..30 years ago tomorrow. In the final moments of a tight game between the Patriots and Dolphins, Cosell was the voice that informed America that John Lennon had been shot and killed in New York. For years after that Howard accepted praise for interrupting the game to deliver the sad and stunning news. However what many don’t know is during a commercial break before that he pretty much refused to make the announcement until he asked Gifford for his opinion. Frank said without question you have to let people know so Cosell reluctantly agreed and I’m sure until he died he never gave Gifford any credit. Sometimes you just have to wonder what people in business are thinking. who might be able to answer our question. We didn’t wait and drove a few miles down the road and found just what we were looking for. Mixed weekend for the two Ocean County teams that played Saturday for state sectional football championships. Lacey capped off a perfect season with a 56-7 rout of Delsea while Brick Memorial was shut out by Sayreville 14-0 in a game played before 45,000 empty seats at Rutgers. The day also saw Shore Regional, Freehold and Rumson-Fair Haven capture titles with Rumson’s upset of Matawan considered among the biggest anyone can remember in the 36 years the playoff system has been around involving a Shore Conference team. Monsignor Donovan senior Thomas Albanese is one of 50 national Semifinalists for high school football Rudy Awards which honors those players who bring heart if not great talent to the game. Albanese was nominated by his coach Dan Duddy for the attitude and sacrifice he brings to the program. Despite being a senior he would play in JV games to help make a contribution to the Griffins and never missed a practice. An only child, he lost his father to cancer just before entering Monsignor Donovan but never felt sorry for himself and always went out of his way for others. The winner will receive a $10,000 college scholarship with two runner-ups each receiving $5000. Named after a former Notre Dame Player, you can vote for Albanese online at www.highschoolrudyawards.com. Online voting will continue through December 28th. The high school football season will come to an end tomorrow and it could result in as many as five teams from the shore winning state sectional titles. Lacey will try and complete a perfect season and win the fourth state championship in school history when they host perennial South Jersey power Delsea in the South Jersey Group 3 final at 1pm. The Lions senior class might be the best in school history and boasts a number of outstanding players including Jarrod Molzon, Craig Cicardo, Dave Viera, Jake Dabal and Matt Uveges. Brick Memorial plays the final game of the season as the Mustangs will battle Sayreville in the Central Jersey Group 4 Final at Rutgers tomorrow night at 7, in a game which we will broadcast on our sister station 105.7FM. The Mustangs beat the Bombers in the title game two years ago but lost in the final to Monroe last December as this is the third straight year Walt Currie has coached a team into the championship game. More so than in the past this is a balanced team with no players whose season statistics will wow you in any way. Mike DiGuilmi runs the triple option attack but this team’s success is largely based on a swarming defense, led by Will Wowkanyn. The long day of football at Rutgers tomorrow begins with Shore playing Dunellen for the Central Group 1 title and features a Middletown South-Freehold Central Jersey Group 3 collision. Also Saturday, Matawan will aim for its second straight Central Jersey Group 2 championship when they face shore rival Rumson in a game at Kean University. We have also selected Lacey’s Lou Vircillo and Mark Costantino of Shore as Coaches of the Year in Ocean & Monmouth counties and our Players of the Year are record-breaking running back Matt McLain of Pinelands, Manalapan running back Josh Firsker, Frehold linebacker Jazzmar Clax and Brick Memorial’s defensive hurricane Will Wowkanyn. When I stepped outside this morning it suddenly hit me….winter is coming. Never mind what the calendar says I just have this feeling that we are now entering that period in which cold weather will pretty much be what we face each day. I looked at the extended forecast and over the next ten days it is not expected to get out of the 40’s and obviously that means at night and early in the morning it will likely be in the 30’s on a regular basis. While for some they welcome this because it will make them feel more like Christmas, I personally don’t relish the thought that we are coming into a period in which warmth only comes when the heat is on. I guess it bothers me because it signals what is seemingly the longest period of the year and as I get older I swear winter becomes longer and summer gets shorter. What’s worse than getting up at 3am and having to go out and warm up your car or worse-yet….scrape ice off your windshield? Truthfully December doesn’t usually bother me all that much because we really don’t get severe winter weather in this month…that was until last year when we got crushed by a pre-Christmas blizzard. If that were to happen again frankly I will probably just crawl up in a corner and cry because it just made for what seemed like an endless period of cold weather and snow. What we need is a quiet December with maybe a little dusting of snow on Christmas Eve for visual effects and that’s about it. January and February are endless no matter what but if December is mild it will help speed along the process until we get to spring which right now seems more like years and not months away. As for summer….I can’t even fathom that there will be a day again in which I can sit on the beach basking in warm sunshine with a cool ocean breeze. Man I have to snap out of this! An unrelated program note. The season-ending edition of the Saint Barnabas Healthcare High School Football Show will air tonight on 105.7FM from 7-9pm. Clearly those that run college sports need lessons in geography and in simple math. The Big Ten conference has 11 teams and next year will add another to make 12. The Big 12 conference has 12 teams but will lose two next year and have 10. Wouldn’t it make sense for the two conferences to switch names? The Pac 12 conference will expand to 14 next year but not change its name. Louisiana Tech is in the Western Athletic Conference. Saint Louis is in the Atlantic Ten Conference, the University of Denver is in the Sun Belt Conference and just this week the Big East Conference announced it will add TCU as in Texas Christian University. That should make travel agents used by the schools very happy. Plus it will result in some great rivalries….nothing like a Syracuse-TCU soccer game. I’m not sure exactly how it came to me but the other day I received an email with an attachment. The attachment was a copy of the contract offered to E.J. McGroarty to play for the Green Bay Packers during the 1944 season, along with a personal welcome letter from Packers coach Curly Lambeau. McGroarty would have his transportation paid to Green Bay, receive $35 a week during training camp and would get $150 per game. Well it appears he signed the contract but I guess he did not make the team because there’s no record of him playing for the Packers. Think of all that money he missed out on. I have always thought that of all the sports awards given out annually the most prestigious in some ways is Sports Illustrated’s “Sportsman of the Year” because it’s more than just performance based. This year’s recipient is Saints quarterback Drew Brees, who led New Orleans to an improbable Super Bowl victory. He is also a terrific person whose foundation has worked hard to help rebuild the city after Hurricane Katrina. A great choice!